Experienced hobbyists have learned a lesson over the years that many newer hobbyists do not like to hear. If an orchid wants to die, don’t spend a lot of time trying to save it. This is often a hard lesson for new growers who just spent what seemed like a large amount of money for a gorgeous orchid plant in flower or for some unusual species that a speaker was selling. The fact is that once an orchid plant starts “toward the light” it’s hard to stop it. Also, growers with many plants want to remove that potential carrier of disease from the growing area as well as spend their limited time on other orchids that are growing well. There are times, however, when you just are not willing to let an orchid die. 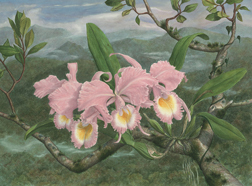 It might be a very rare and hard-to-find orchid, or it might be the first orchid you purchased. Just about everyone has “nostalgic” orchids in their collection. While difficult, orchids headed toward that great mulch pile in the sky can often be brought back. Here are some of the tricks of the trade. Before reading this, remember that orchids do not have immune systems like animals. Treating orchids requires that you understand and take advantage of the mechanisms that orchids use to fight disease and pests. Instead of moving disease fighting cells to the infection like we do, orchids instead separate healthy cells from unhealthy cells by building walls between healthy and unhealthy tissues. Infection of a plant has an entry point every time. This fact can be as important in treating an orchid as the diagnosis. The first step is coming up with a diagnosis. If you can see where the problem started, there is an excellent chance that the plant can be saved. Often, the tip of a leaf or a new growth turns black indicating where the rot has started. If there is healthy tissue on the rhizome or at the base of the leaf the orchid can generally be saved. Most fast acting diseases are caused by bacteria. If bacteria have penetrated to new growths or reached the center of a phal or vanda, it is often too late, but it can be worth a try if it is a very special plant. My first tactic is to remove all of the black or dead tissue, which requires removal of the plant from the pot. Totally wash all media from roots. I use a small jet from a hose to wash the orchid. Next, I spray the entire plant with household hydrogen peroxide. Then, place the plant on a newspaper in a spare room where there is plenty of air movement and little humidity. The main point is to kill the bacteria and stop the infection. Check the plant each morning and night before bed for any soft or watery spots and remove any you find followed by spraying the new wound with hydrogen peroxide. Your plant should remain dry and will look desiccated. Avoid the temptation to mist. If after a week no new rot spots have appeared and the orchid is green, you have a chance to save it. Put the plant at the bottom of a new clay pot and set it in a shady part of the greenhouse. At this point, I will move it out when I water because I do not want the plant to get wet until I see signs of growth. When new roots or leaves appear, water it. Once roots begin to attach to the pot, gently place a small quantity of media in the pot and leave it alone until it is clear that the orchid has resumed growing. Next move it back to the proper light level. If caught early, an orchid with rot can be saved.